Her feet with do a happy dance in this pretty li’l pair by Kyoot! Another favourite with the boys, these sandals come with top stitching and a button detail along with a flexible and sturdy sole making it a top pick! 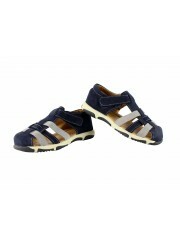 These dapper open toed sandals transition easily from sports to casual comfort! Twinkle like a fairy in these sparkly sandals for your little angle! Beautifully designed with utmost care, she is sure to make these her favourite! How about some little heart to heart for your sweetheart? Here’s a pair for the Queen of hearts. A combination of pastel colours and attractive design makes this pair a great match with every outfit! With fashionable flowers and button detailing, these sandals are the perfect pair for her spring and summer dresses! Step out in style in these leather sandals by Kyoot. 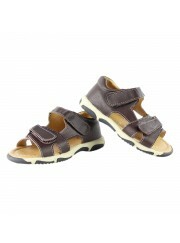 Sturdy and comfortable with a fashionable styling, be sure to buy these! These classic whites with a decorative metal clasp are comfortable and sure to be your little princess’ favorite! 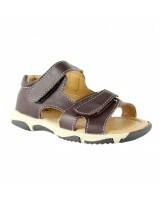 These understated yet classy sandals with a chic design can be dressed up or dressed down as you please!